John Nevil Maskelyne was born in Cheltenham, England on 22nd December 1839, the only boy of 8 children. He trained and worked as a watchmaker but became interested in magic after watching a performance by famed (and bogus) spiritualists, the Davenport brothers. With a friend, George Alfred Cooke, a cabinet maker, he replicated their tricks at a show in Cheltenham in 1865. Fuelled by this success the two men decided to become professional magicians and formed a partnership that was to last until Cooke's death in 1905. During this time, amongst other successes, they had a residency at the Egyptian Hall in Piccadilly, London, from 1873 to 1904. In 1905 Maskelyne partnered with David Devant, a partnership that was to last 10 years under the name "House of Magic". He was adept at creating illusions, the best known of which was levitation. His other, unusual, claim to fame is that he invented the 'penny-in-the-slot' apparatus for public toilets! He also had over 40 patents, covering such things as wireless telegraphy and railway signalling. Like Houdini he was active in trying to disprove psychic and paranormal powers. In 1914 he founded the Occult Committee, which had the aims of investigating claims to supernatural powers and exposing fraud. 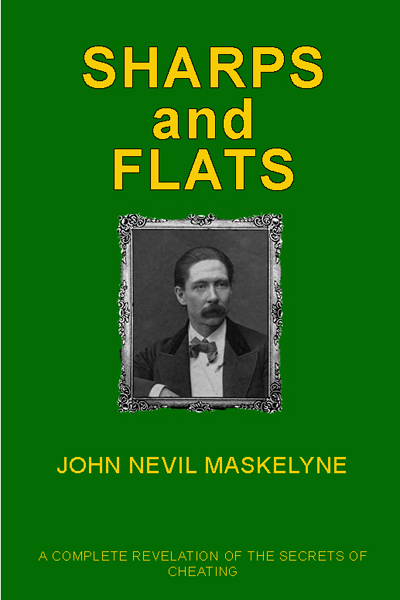 He published this book, Sharps and Flats in 1894. It was an instant success and is considered to be one of the great classic gambling books. However, it is also a wonderful book for magicians as many of the things exposed in it can prove the basis of magic tricks.